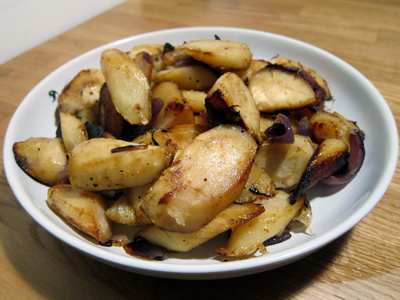 Roasted parsnips are a new vegetable dish in our home. I’d never cooked parsnips before, but turns out they are quite easy to roast. A little sweeter and nuttier than carrots, parsnips pair very nicely with slow-roasted lamb — and together, they make a great Sunday dinner! 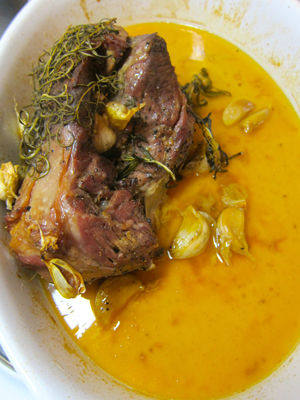 My favorite recipe for a slow-roasted lamb is Jamie Oliver’s “Incredible Roasted Shoulder of Lamb” — although the recipe calls for the shoulder, you could also apply the roasting method on a leg, which is what I did. Preheat the oven to 400F (or about 200C). 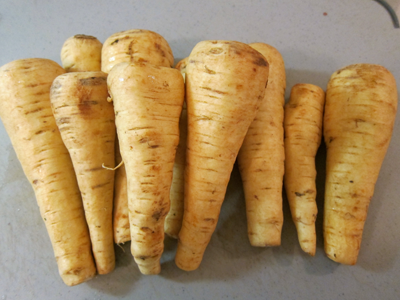 Peel the parsnips and cut them into approx. 1/2 inch slices; lay them out in a baking dish. Chop up a red onion (or 2, if you like red onions); peel and halve 6 or so cloves of garlic. Add some sprigs of thyme or rosemary. Drizzle with olive oil, season with salt and pepper, and mix. Add about 3 tablespoons of water. Cover tightly with foil, and put in the oven. After about 20 minutes, take off the foil. 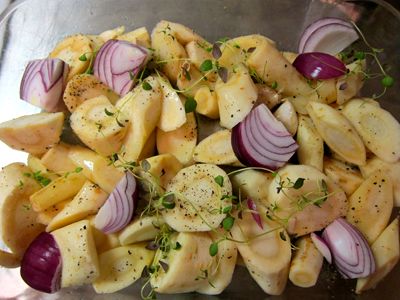 Toss the parsnips/onions/garlic, and continue to roast for another 20 minutes or so, until tender. I like to keep moving the vegetables, so that they brown evenly. If you want to crisp up the edges, broil for 5 minutes at the end. The turnips keep for several days and make for a delicious sweet-ish veggie snack! 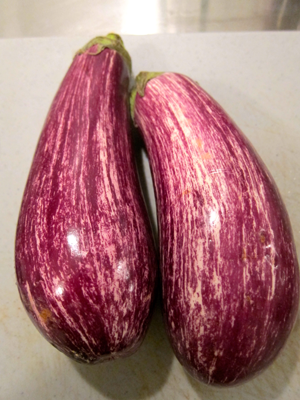 I found these beautiful, organic Japanese eggplants at the supermarket the other day. 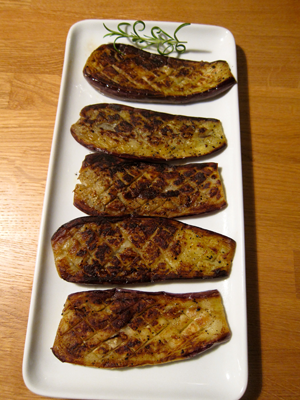 Japanese eggplants have thinner skin than the more typical, large purple variety, which make them easier to grill skin-on. The only problem was that I didn’t buy more of them, because I LOVE grilled Japanese eggplants and I should have been more honest about how many eggplants I could consume in one sitting. 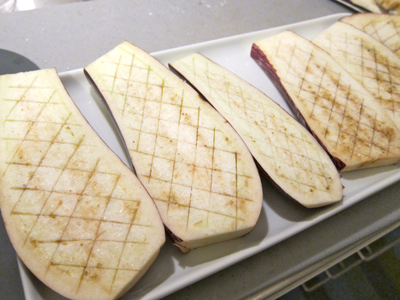 Trim the top and bottom of the eggplants, and cut into about 1/2 inch slices, skin on. Score the eggplant slices, making sure not to cut through to the other side. Salt generously, and set aside for about 30 minutes. The eggplants will “sweat” and soften. When softened, rinse the eggplants under cold water and pat-dry with paper towels. Toss in olive oil seasoned with salt and pepper. In a heated skillet, grilled the eggplants until browned on both sides and the eggplants are extremely tender. These grilled eggplants were AMAZING. Melt-in-your-mouth tender, and we ate them in a flash. Next time, I will make sure to buy more eggplants! 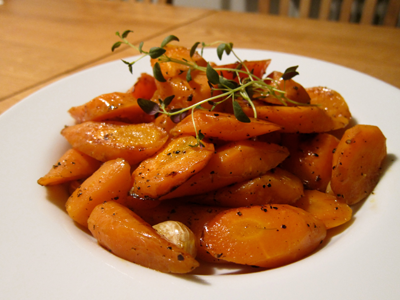 Here’s a simple, delicious way of roasting carrots. Preheat the oven to 200C (or about 400F). 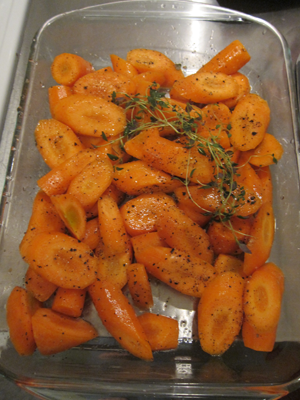 Peel and chop carrots in about 1/2 inch thickness (I used 4 large carrots), and lay them out in a roasting pan. Add a drizzle of olive oil and juice of one orange, season with salt and pepper, and mix well. Throw in a a few garlic cloves (skin on), and a some thyme. Cover the pan with aluminum foil and put in the oven. Roast for about 30 minutes, or until a fork easily goes through the carrots. Take off the foil and broil for about 5 minutes, until the edges are slightly browned. The fresh orange juice gives the carrots a nice brightness. 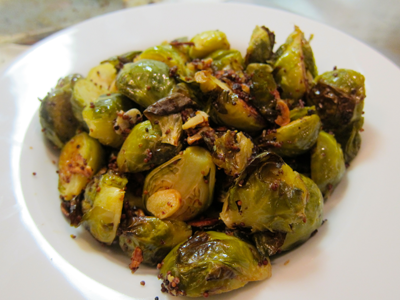 Roasted Brussels sprouts are easy to make and also delicious. 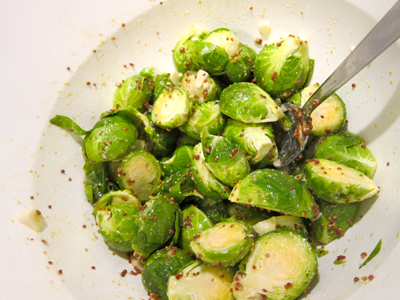 I love garlic in most everything, and garlicky Brussels sprouts are awesome! Recently, I also added some wholegrain mustard, which turned out great. Cut the Brussels sprouts in half, taking off any stem bits that are brown, as well as any shriveled or brown outer leaves. Thinly slice about 4 garlic cloves. Mix them in a bowl with olive oil (about a tablespoon), whole grain mustard (about a tablespoon), and a generous amount of salt. Put the sprouts in a roasting dish, preferably in one layer (a sheet pan would work well, too — but I don’t have one in our apartment in Stockholm). 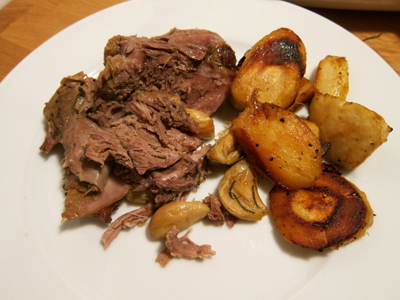 Roast for 30-35 minutes, until crisp on the outside and tender on the inside. Be careful not to overcook the sprouts,as they will get mushy — I like to take a fork and test them (if it goes through easily, they’re done). 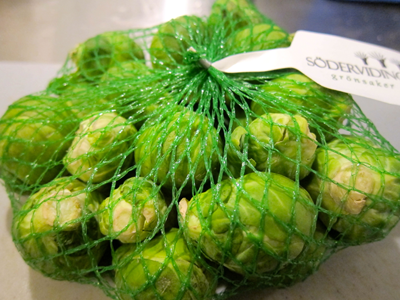 While roasting, I like to move around the sprouts from time to time to make sure they brown evenly.